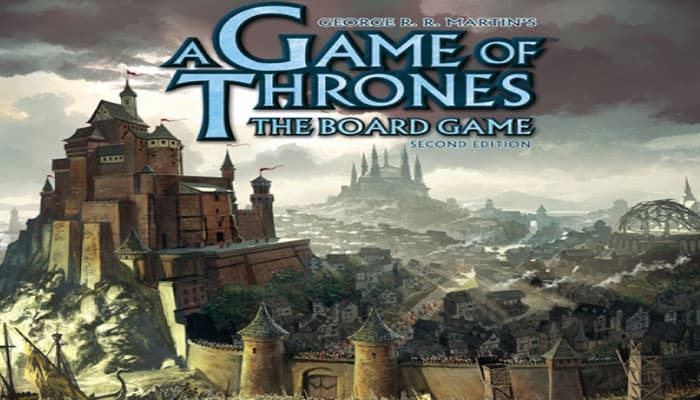 A Game of Thrones is a strategy board game in the world of the epic fantasy TV series. King Robert Baratheon is dead and the lands of Westeros brace for battle and the Throne. All Players control one of six Great Houses seeking dominance over the lands of Westeros. Each House, from honorable Stark in the north to wealthy Lannister in the West, is provided a limited number of tokens, cards and units like footmen, knights, siege engines and ship units. Each house has their own strengths and weaknesses, so players must marshal their forces different. It's an epic boardgame that requires more than military might to win. Only by mustering armies, raiding, conquering territory and forming alliances, each House can claim to control the most Castles and Strongholds. At the end of the 10th game round, the House that controls the most areas containing either a Castle or Stronghold is declared the winner and can ultimately claim the Iron Throne. But if during the game, a player controls seven such areas, that player immediately wins. Prepare the Game Board: Unfold the game board and place it in the center of the play area. Whenever a player marches one or more of his units into an area containing units from another House, combat ensues. Combat is resolved by comparing the total Combat Strength of the battling sides. The victor is the player who gathers the highest Combat Strength. In the icy north, an army of barbaric wildlings gather to descend upon the continent of Westeros. The ancient order of the Night's Watch protects the massive Wall that defends against these (and even more insidious) dangers. Yet the strength of the Night's Watch will fail without the support of the great Houses. The Wildling Threat token reaches "12" on the Wildling track. 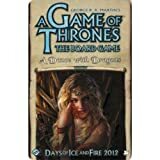 A "Wildling Attack" Westeros card is drawn and resolved. A House is said to control a land area when it has at least one Footman, Knight, or Siege Engine in the area, or has previously established control in that area by placing a Power token there. If a player vacates a land area with all of his units, he stands to lose any benefit gained from controlling that area unless he chooses to establish control. Ports function as a special area between the land and sea area they connect. Only the player controlling the connected land area may use the connected Port and is considered the Port's "owner". Neutral Force tokens represent the resistance of independent houses unwilling to submit to the machinations of the players. Neutral forces are placed on the board during setup. Players may march units into an area occupied by a Neutral Force in order to destroy the Neutral Force and control the area. This may not be attempted, however, unless the marching player has sufficient Combat Strength to defeat the Neutral Force. 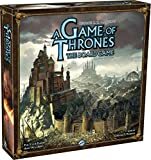 During the time of A Song of Ice and Fire in which A Game of Thrones: The Board Game is set, the following Houses are the principal players in the struggle for the Iron Throne. House Stark "Winter is Coming"
A reclusive family with honorable traditions that has been reluctantly pulled into the game of thrones. House Greyjoy "We Do Not Sow"